This really pretty royal ruby red depression glass Oyster and Pearl 10 1/2 Inch diameter Large Fruit or Serving Bowl made by Anchor Hocking Glass from 1938 to 1940. This Bowl is in very good condition with no chips, cracks or scratches. The inside is very shiny. 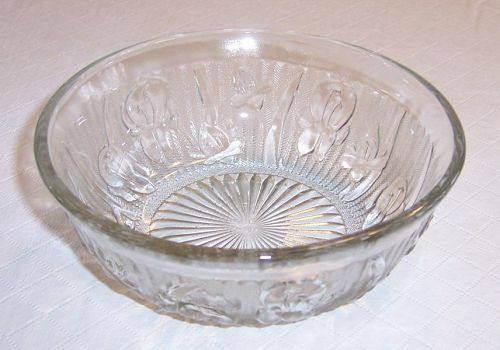 Be sure to search our other Anchor Hocking depression glass we have available. We guarantee items to be as described. THANK YOU. 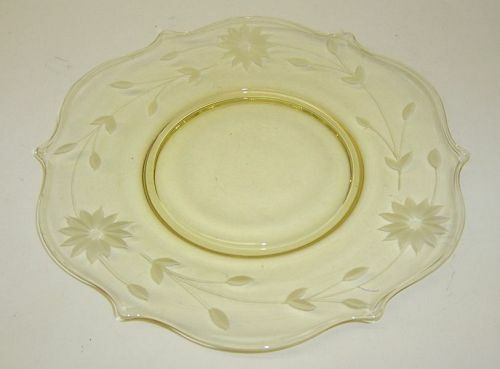 This really pretty yellow depression glass Jubilee 8 1/4 inch Salad Plate was made by Lancaster Glass Company in the early 1930s. This plate is in very good condition with no chips, cracks or scratches. We guarantee items to be as described. THANK YOU. 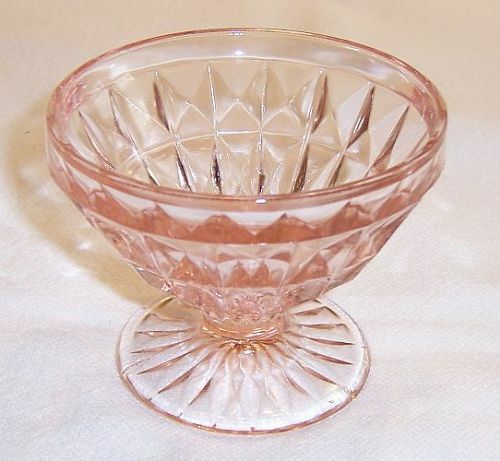 This pretty depression glass pink Windsor Diamond 2 5/8 inch high Footed Sherbet Dish was made by Jeannette Glass from 1932 to 1946. This Sherbet measures 3 3/8 inches in diameter at the top and is in very good condition with no chips or cracks. Be sure to search our other Windsor available. We guarantee items to be as described. THANK YOU. This is a pretty depression glass pink Floral, aka Poinsettia, 4 inch diameter Berry or Dessert Bowl made by Jeannette Glass from 1931 to 1935. This Bowl is in very good condition with no chips, cracks or scratches. 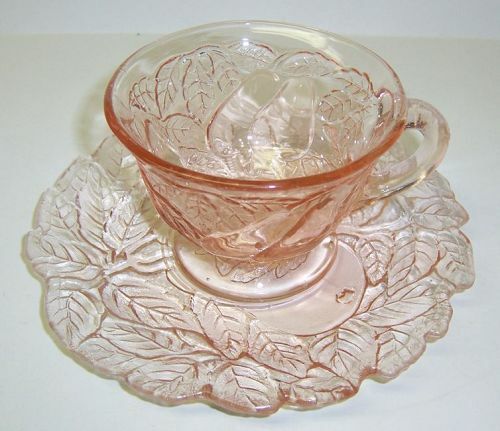 Be sure to search our other Floral depression glass available. We guarantee items to be as described. THANK YOU. 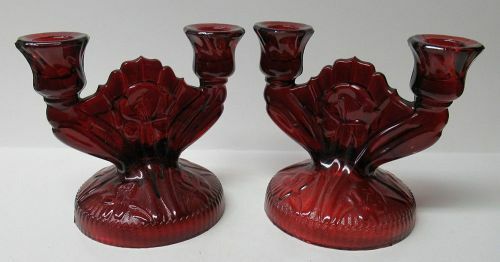 This is a really great, vintage, pair of pink Adam 4 Inch high Candlesticks Candle Holders made by Jeannette Glass from 1932 to 1934. The Candlesticks each measure 3 1/2 inches square at the bottom. They are both in very good condition with no chips, cracks or damage. 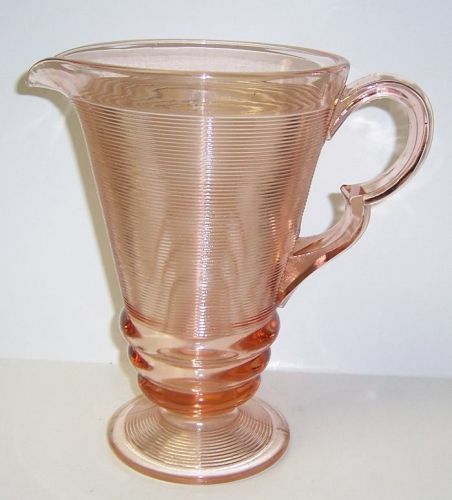 Be sure to search our other depression glass available. We guarantee items to be as described. THANK YOU. 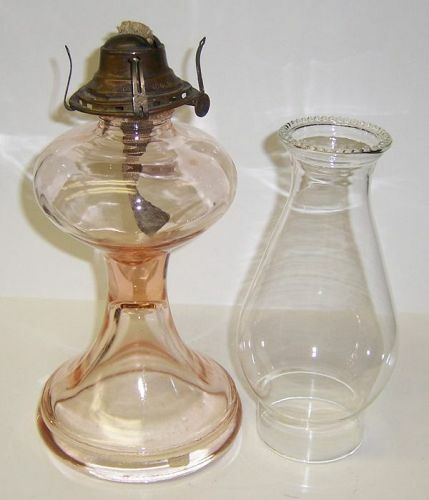 This is a really great, vintage, depression glass pink Avocado 'Sweet Pear', No. 601, Tea or Coffee Cup and Saucer made by Indiana Glass from 1923 to 1933. This Cup measures 3 5/8 inches in diameter. The Saucer measures 6 1/4 inches in diameter. Both the Cup and Saucer are in very good condition with no chips or cracks. There are a few small bubbles in the glass, which occurred in the making, and was common in the old glass. Be sure to search our other depression era glassware available. This pretty green Cherry Blossom depression glass flat Creamer or Cream Pitcher was made by Jeannette Glass from 1930 to 1939. The Creamer measures 3 inches high and is in very good condition with no chips or cracks. Be sure to search our other Cherry Blossom available. We guarantee items to be as described. THANK YOU. 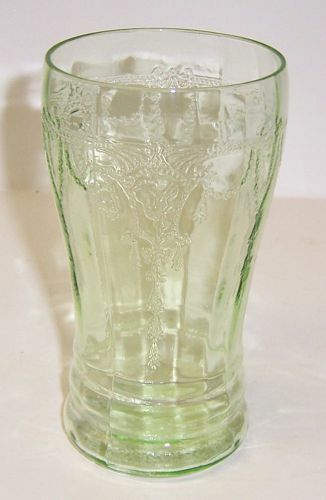 This is a really pretty Depression glass green Cameo, aka Ballerina, 5 inch high Flat Water Tumbler made by Hocking Glass from 1930 to 1934. This Tumbler holds 11 ounces full to the top. It is in very good condition with no chips or cracks. Be sure to search our other Cameo Ballerina available. We guarantee items to be as described. THANK YOU.